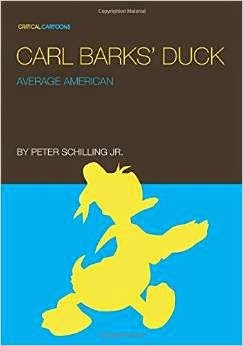 Barksisti Peter Schilling on julkaissut kirjan Carl Barks' Donald Duck: Your Average American. Ja koska Carl Barksin töistä ei koskaan voi kirjoittaa liiaksi, kuuluu tämäkin teos jokaisen ankistin kirjahyllyyn. From 1942 to his retirement in 1966, Carl Barks drew Donald Duck comic books (the seventh greatest comic of the twentieth century according to The Comics Journal) for Walt Disney. He took what should have been a bland franchise and turned it into a classic of comics. Drawing on his own experiences (most notably a brief stint as a chicken farmer), Barks went to create a character who was remarkable ...for not being remarkable. In his pursuit of a good job, his boredom with suburban life, his temper, his squabbles with neighbors, and his resolve in the face of his many failures, Barks's Donald Duck was truly your average American. Peter Schilling, Jr. is the author of The End of Baseball and writes about film and the arts for a variety of publications. He has been reading and studying Carl Barks's entire catalog since he was a child. Voit tilata kirjan esimerkiksi Amazonin kautta.